Well, in the USA college football season is well underway! 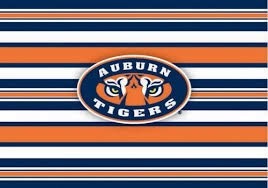 I was introduced to the Auburn Tigers last fall, and decided that they are a good team, so I am continuing as their fan. It has come to my attention, per one of my best friends and the Pastor of the church I work at, there there are “fans” and then there are “fans”. Let me explain… one type of fan, went to the college. My best friend attended Georgia Tech. So that’s his team. He is invested there and loves it. Pastor Butch went to Mississippi State. Same thing, that’s his team. I did not attend Auburn. So I’m a different type of fan. So many people jump on these college football band wagons. We buy the shirts, watch the games, buy other products, etc.. without being fully invested since we did not go to school there. Don’t we do that to God too? We wear the Christian t-shirt, we wear Christian bracelets, we have the fish sticker on our car, but we are just a fan. We are just a “fan” because we aren’t praying everyday, reading our Bible every day, or worshiping God daily. We might go to church on Sunday, and maybe even Wednesday, while other folks don’t really attend church at all. I think the issue is we just aren’t fully surrendered to Him. We aren’t invested. We aren’t sold out. But we will stand up for our football team. God has done WAY more for us than that football team ever has or ever will!